For even the most seasoned runners, deciding what to wear when training outdoors can be tricky — especially during an unpredictable Wisconsin spring. There's the temperature to consider, of course, and the wind. It may rain — or even snow. 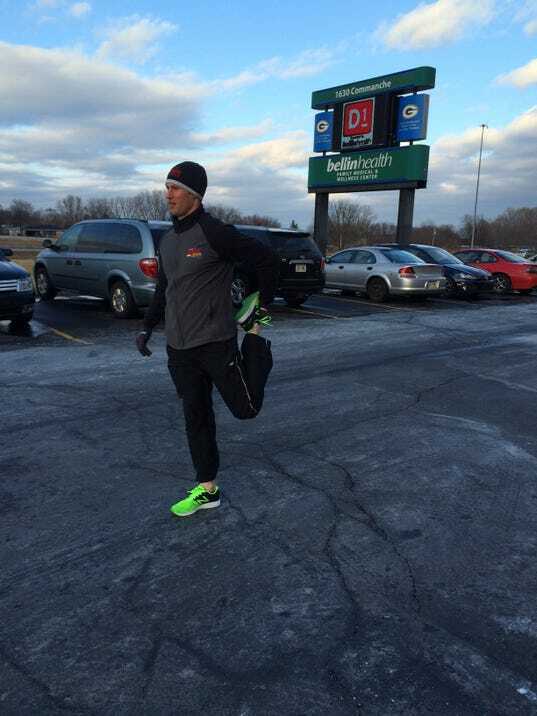 But with a little knowledge and a bit of planning, runners can train comfortably no matter what the elements, said Bellin Health running expert Nate Vandervest. "By following a few simple tips — and with a little trial-and-error — you can run in just about any kind of weather," Vandervest said. "Spring is a great time to train, but you have to be prepared." Dressing in moisture-wicking layers allows runners to maintain a comfortable temperature from the beginning to end of their training run. Runners might consider layering a long-sleeved shirt or light outer layer on top of a short-sleeved shirt. Once they warm up, the outer layer can easily be removed and tied around the waist as needed. Experts advise wearing technical fabrics that wick moisture away from the skin. And although dressing in layers is helpful, runners shouldn't start out too bundled up, Vandervest said. A good rule of thumb is to dress as if it's 20 degrees warmer than the actual temperature. "You'll want to start out on the cool side, because the body warms up quickly once activity begins," Vandervest said. "Wear too much and you may become uncomfortably warm." A brisk wind can make a big difference in how a runner feels the cold, and a chilly rain can become downright uncomfortable if he or she is unprepared. A good way to deal with both, Vandervest said, is to wear a wind-and rain-proof outer shell, such as a water-resistant windbreaker or similar jacket. On race day (or in a pinch), you might even see runners wearing garbage bags with holes cut for head and arms. A runner may also wish to start out wearing a hat or gloves that can be removed if needed — for example, when the wind is at his or her back. Experts advise checking not only the temperature, but also the wind speed and precipitation forecast, before heading out the door. Runners who train in the early mornings or at night should wear reflective clothing and consider carrying a safety light that makes them visible to vehicles, Vandervest said. Wearing bright clothing is a good idea anytime — runners should watch for vehicles and make sure drivers can see them. Finally, daytime runners and walkers should remember to protect themselves from the sun — experts advise wearing sunscreen and considering a hat or visor during any outdoor training that takes place during daylight hours. Consult the Bellin Run Crew experts with questions — and join them for free training runs at 6 p.m. Wednesdays at Bellin Health Ashwaubenon. "Dressing for comfort and safety is an important part of your training," Vandervest said. "We're here to help you get it right."